I’ve been increasingly curious about wines from Marin ever since I attended the 2009 Marin County Pinot Noir Celebration in Larkspur, not far north of San Francisco. I thought the wines were very distinctive, with some outstanding Pinots being poured. Yet it seems that few people, even here in the Bay Area, have any idea that there are winegrapes grown in Marin. Yet, as I found out, Marin has quite a long history in grape-growing and wine, though it’s never been a big industry there. Although there are red Bordeaux varieties planted in parts of the county, as well as Chardonnay and a few other white varieties, vineyards in Marin are dominated by Pinot Noir. The Bordeaux varieties can be difficult to ripen in most areas, and some of the wines have been hit and miss. And up to now, much of the Chardonnay has proven to be better-suited to go into sparkling wine than made as a still wine. Aside from a tiny bit of Riesling that has been quite exceptional, Pinot is the grape that has made its mark in Marin. For that reason, I confined my visits to Marin to the cooler western part of the county, where Pinot Noir is easily the dominant grape variety. But there’s much more to West Marin than grape-growing. West Marin is really a land apart in the busy, metropolitan Bay Area. Sparsely-populated, it’s mostly pasture land. Dairy farming has long dominated this area, with a number of renowned cheese producers making their homes here – Cowgirl Creamery, Point Reyes Farmstead Cheese Company, Marin French Cheese Company are among the best-known. Cattle and sheep ranching and organic vegetable farming are also significant parts of the West Marin economy. Most of West Marin’s farms are fairly small, and many have been in the same family for generations. But being so close to San Francisco, there was increasing pressure on Marin County for construction of new housing and other development. Many in the area feared the permanent loss of the pastoral landscape and of their quality of life. In the late 1960s and early ‘70s, local ranchers and other residents began to take action to preserve the land, together with a new group of like-minded county planners and other officials. To help keep the land in agricultural use in the long-term, the non-profit Marin Agricultural Land Trust (MALT) was founded in 1980. In the years since, MALT has acquired over 40,000 acres of agricultural land conservation easements, mostly purchased but some through gifts from property owners. Without the involvement of MALT and the people of West Marin, the land today might be overrun by highways, tract houses, and shopping malls. Fortunately, much of the land is now protected from this type of development, and West Marin continues to provide the Bay Area with its famous cheeses and other agricultural products. Marin County, immediately north of the Golden Gate from San Francisco, is bounded by the Pacific Ocean to the west, San Francisco Bay to the east, and Sonoma County to the north. Many feel that Marin is separated both geographically and culturally into east and west portions. The flatter eastern part forms a natural route from the Golden Gate up to Petaluma in Sonoma County, while the west is unrelentingly hilly, to this day still unbroken by many paved roads. Not surprisingly, the eastern part is where most of the county’s population and wealth are centered. To the west, the hills and small valleys extend to the ocean. 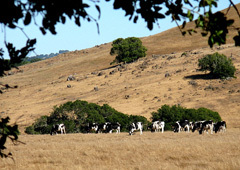 While there are few parts of this West Marin landscape suitable for large-scale agriculture, the land has proven ideal for raising cattle and sheep. Rolling grasslands are punctuated by stately oaks and curiously-shaped rock outcroppings, while denser stands of trees nestle in the hillside valleys and groves of aromatic eucalyptus rise up to the sky. Marin’s climatic differences from most other California winegrape-growing regions begin with the winters. 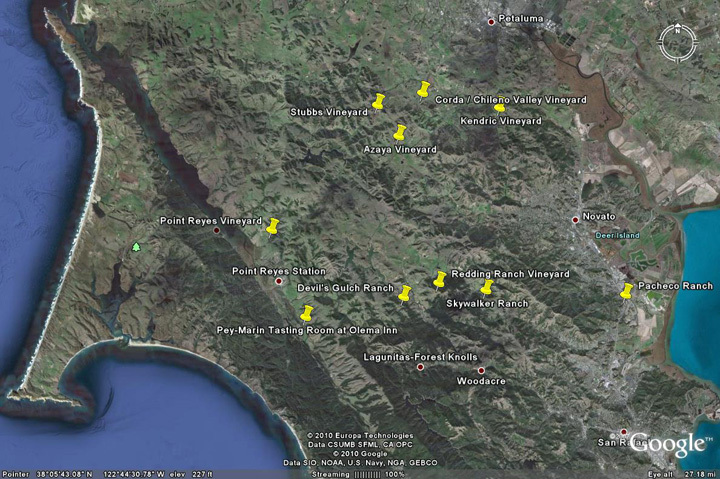 Most Marin vineyards are less than ten miles from either the ocean, Tomales Bay (off the ocean) or San Francisco Bay. Due to the influence of these large bodies of water, winter temperatures tend to be milder, leading to early budbreak on the vines. But the marine influence also leads to generally wetter springs and cooler summers, so flowering, fruit set, and veraison are often later than elsewhere. The result is an exceptionally long, cool growing season with lots of “hang time” for the fruit. Fruit from Marin often develops mature flavors at lower sugar levels and higher acidity than that from many other grape-growing regions in the state. There is an abundance of different soil types in Marin, the result of the land being continually pushed and pulled by the actions of the San Andreas Fault – it runs through Tomales Bay, separating the Point Reyes peninsula from the rest of West Marin – and by other geological forces. Decomposed sandstone and loamy soils with varying amounts of clay content seem particularly common in the vineyard sites. A couple of people I met on my travels mentioned the need to plant in soil that is relatively low in magnesium, the magnesium being bad for vine health. It was pointed out to me that the outcroppings of serpentine rock commonly seen throughout West Marin tend to indicate areas with higher magnesium levels in the soil. Vitis Vinifera grapes were probably first planted in Marin County when the San Rafael Mission was built in 1817. It seems that these vines were torn out and at least some moved to General Mariano Vallejo’s rancho in Sonoma County in the 1830s. In the later nineteenth century, a number of immigrants to the country planted vineyards and started wineries. Among these was Hermann Zopf from Germany, who planted vines and built a winery, saloon, and restaurant in San Rafael in the late 1880s. Frenchman Jean Escalle planted 23 acres of winegrapes on his property in Larkspur in the 1890s and built a winery there. 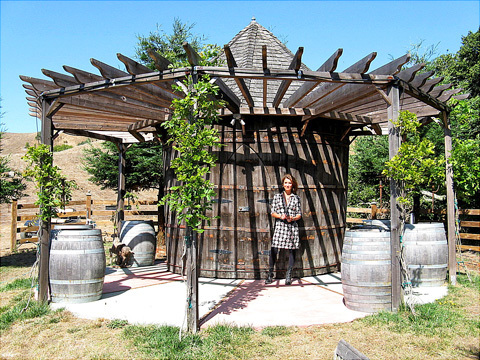 The structure is still there, and in fact it now is the venue for the annual Marin County Pinot Noir Celebration. There were other commercial vineyards and wineries that were started during this time, and many landowners planted their own small vineyards (and presumably made their own wine). Of course, Prohibition largely wiped out Marin’s small wine industry, and it was many years before commercial viticulture and winemaking started to take root again in the county. More information on Marin’s wine history can be found on the “Scenic Root Winegrowers” website. 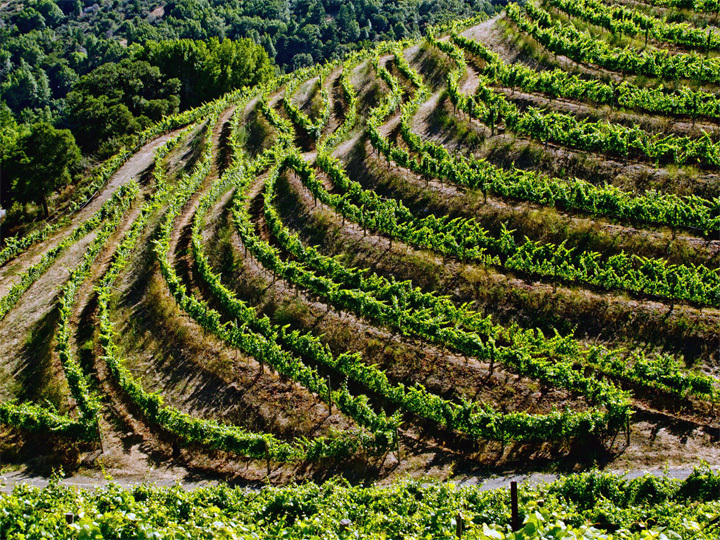 There are few vineyards of any size in Marin County. Corda Family Vineyard (also called Chileno Valley Vineyard) is probably the largest in the county, and it’s only 35 acres. I was able to visit most of the significant vineyards in West Marin on my travels there. 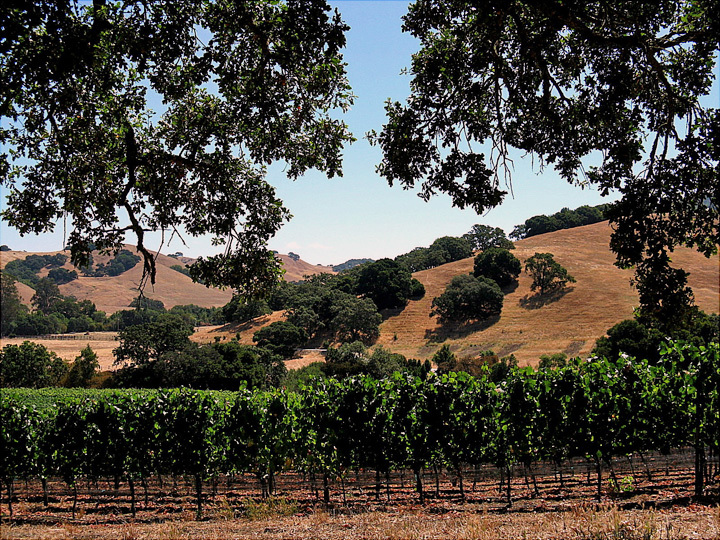 There are a few vineyards in eastern Marin, including seven-acre Pacheco Vineyards in Novato, with Cabernet Sauvignon and Cabernet Franc planted in 1970 on land that’s part of the historic Pacheco Ranch. In addition to these, there are a number of smaller “backyard” vineyards throughout Marin, but the vineyard land totals only around 200 acres for the entire county. 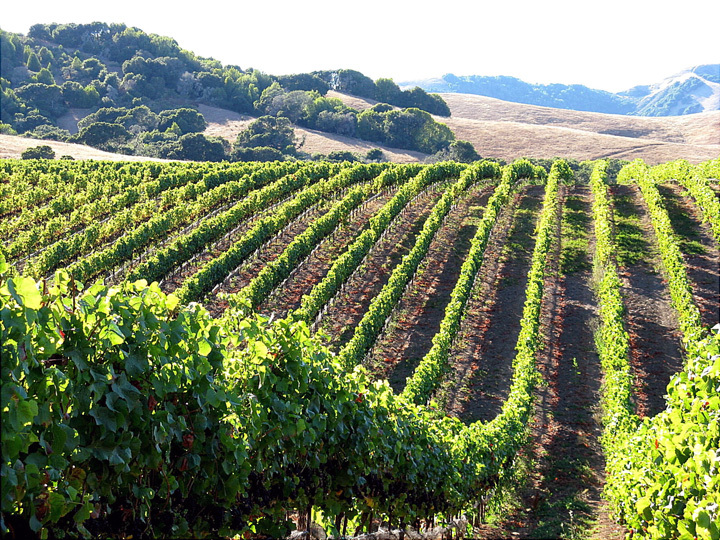 By comparison, Sonoma County has over 50,000 acres of vineyards. There are just a handful of producers actually making wine in Marin County, the best-known being Sean Thackrey, who makes his wine in Bolinas. Along with a number of other wines, he makes a Pinot Noir from Marin fruit, the “Andromeda” bottling from Devil’s Gulch Ranch. Unfortunately I was not able to schedule a visit with Sean as part of this report, but I’m hoping to visit him for a future write-up. Kalin Cellars in Novato is well-known as well. They produced sparkling wine from Devil's Gulch Ranch in the mid- to late '80s (they still list the 1988 Cuvèe Rosé Reserve on their website), but they no longer produce any wines sourced from Marin fruit. Kalin is notable for cellaring their wines for many years prior to release – their current releases include a Chardonnay and a Pinot from the 1994 vintage! 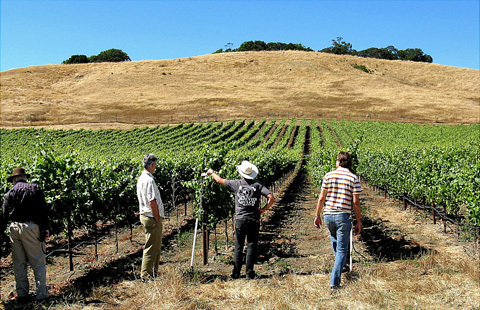 Other Marin wineries include Point Reyes Vineyard in Point Reyes Station, which makes Pinot Noir and sparkling wines from its five-acre estate vineyard just off of Tomales Bay, as well as several wines from other vineyard sources. They operate one of the only winery tasting rooms in Marin, as well as a bed-and breakfast inn. Corda Winery has a small facility not far from their vineyard in Chileno Valley. Pacheco Ranch Winery in Novato focuses on Cabernet from Pacheco Vineyards near Novato. Unfortunately Ross Valley Winery in San Anselmo closed down earlier this year. They had made wines sourced from outside Marin as well as making mead. A new winery on the horizon is McEvoy Ranch in West Marin. Well-known for their olive oil, the McEvoy family now have a vineyard of nearly eight acres, with mostly Pinot Noir planted. 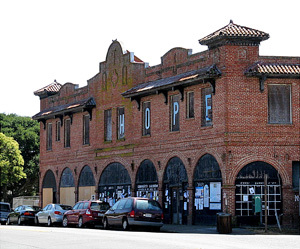 They are currently seeking approval to convert one of their buildings into a wine production facility. In addition to the handful of wineries in Marin County, a number of other wineries make wines from fruit grown in Marin County. The largest buyer of Marin fruit is Schramsberg Vineyards in Napa, which uses both Marin Chardonnay and Pinot Noir in its acclaimed sparkling wines. In addition to the producers I visited, wineries making Pinot Noir from Marin County include Vision Cellars, Dutton-Goldfield, Thomas Fogarty, Precedent, Vergari, Willowbrook, and most recently, Acacia, DeLoach, and Skywalker Ranch (where over 20 acres of new Pinot vines are now in production). At this point, there are few facilities available for actually producing wine in Marin, so except for the few who are fortunate enough to have their own wineries in the county, most of those who would like to make their wine there have had little choice but to look elsewhere. David Vergari seems to represent many of these winemakers in their interest in making wine from Marin fruit. He made Pinot sourced from Corda Family Vineyard from 2006-2008 and he’s hoping to make some Marin wine again in the future. David told me that the area appeals to him for its uniqueness. He feels the Pinots made from Marin fruit offer something different from those made elsewhere in California. He also pointed out one reason why Marin’s small wine industry remains largely unknown– the virtual absence of wineries and tasting rooms in the county makes it nearly invisible to the outside world. While there is a Marin County Winegrowers Association, it seems to be quite limited in its promotion of Marin wines to a wider audience (though it does produce the excellent annual Marin County Pinot Noir Celebration, which benefits MALT). I made three separate visits to West Marin during August 2010, visiting vineyards and meeting growers as well as several producers who make Marin wines. I went by myself on the last two occasions but on the first day I was accompanied by Al Osterheld, Eric Lundblad, Paul Homchick, and Atilla Telli. We met just off of Highway 101 near the northern edge of Marin County, and continued from there to our first appointment. Our first stop of the day was at Kendric Vineyards. Fortunately, Kendric owner/winemaker Stewart Johnson had sent me directions on getting to the vineyard, along a dirt road a mile or so south of San Antonio Road, which runs along the Marin/Sonoma border. I’d met Stewart at the Marin County Pinot Noir Celebration in 2009 and run into him on a few other occasions since that time. I thought his wines were among the best at the tasting so I was interested in seeing his vineyard and finding out more about his winemaking. Stewart was working in the vineyard when we arrived at the gate, and he came down to greet us and let us in. Although his background is in law, he also has a family vineyard connection – his family owns a vineyard in Shenandoah Valley in Amador County. Growing up, Stewart did some agricultural work in the Amador area and also helped plant the Sangiovese in the family vineyard there – this fruit now goes to the Sangiovese specialists at Vino Noceto for a single-vineyard bottling. Stewart’s mother Kathleen still owns the Amador vineyard; his father Kendric passed away in 2001, just as Stewart’s own wine project was getting underway, and the vineyard and winery are named as a tribute to him. Stewart’s wife Eileen Burke has a law practice in San Francisco, and they have two young children. I asked Stewart why he decided to plant a vineyard in Marin County. He responded that he had “caught the Pinot bug” (even before Sideways!) and with his vineyard background, he wanted to plant and farm his own vines. Looking at cooler coastal sites, he realized that land in Sonoma was out of his price range and that forcing Eileen to commute to San Francisco from Sonoma County was not an option. He found that the cost of leasing land in Marin was still reasonable, and the climate was what he was looking for. Another plus was that Marin was relatively undiscovered as wine country and he could be something of a pioneer in the area rather than join an already crowded field in Sonoma. Stewart’s next task was finding the right location for the vineyard. He told us (a story that was repeated many times during my vineyard visits) that soils in Marin are very convoluted, with little uniformity even within smaller sites. Ultimately, Stewart took a long-term lease on a former dairy ranch owned by the Corda Family, who own quite a bit of farm and ranch land in Marin. Located just south of the Petaluma Gap – we could see the fog still clinging to some hills not far away – the vineyard is protected from wind by the tall hill just to the west. Sloping down toward north-northeast, the hillside site is in a spot that tends to be a bit warmer in the summer but cooler in the fall. In 2002, Stewart planted 8½ acres with a total of 12,000 vines. The soil is mostly shale and shallow sandstone loam, but Stewart noted that it changes a lot throughout the site. 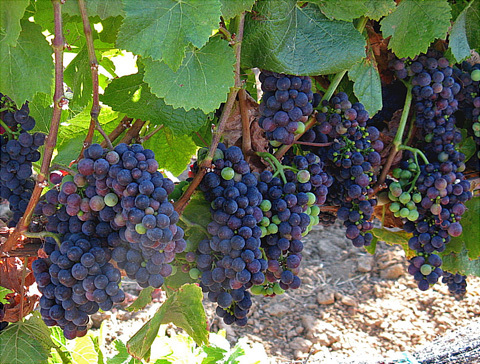 There are seven clones of Pinot planted – mostly 115, 777, and Pommard, along with some 667, 828, 37 (Mt. Eden), and Martini – plus some very small test blocks of Viognier, Syrah, and Malbec, to see how they ripen there. Rootstocks are 3309 on the steeper sections and 101-14 on other parts. Vineyard rows are in a north-south orientation, to help the vines get more even sun exposure. The vines are cordon-pruned, with vertical shoot positioning (VSP) trellising. Stewart told us that he used to do regular leaf-pulling to help open up the fruit zone of the vines, but he no longer does that unless there is heavy powdery mildew pressure. 2004 Pinot Noir, Marin County: Light color, bing cherry with tea leaf and earth overtones, bright acidity and a clean finish. Quite a restrained and elegant Pinot from a vintage that produced a lot of very big, ripe wines in California. 2005 Pinot Noir, Marin County:Light color with a very slight cloudy appearance – this wine was not filtered at bottling. The fruit profile was a bit darker than the ’04, and this had more weight on the palate, but it did not have the structure that the ’04 displayed. 2006 Pinot Noir, Marin County: Slightly lighter color, with a very pretty, somewhat floral nose, along with bright red fruit aromas, mainly strawberry and bing cherry. The oak was held well in the background, providing just a bit of spice but all in balance. Similar to the ’04 in some ways, with tea leaf notes and great acidity and just a bit of tannic bite on the finish. My favorite of the Kendric Pinots. 2007 Pinot Noir, Marin County: Light color, the aromas are of riper cherry with a more noticeable touch of spicy oak. The mouthfeel was more lush than the earlier vintages, and this probably needs a bit more age or a good decanting to bring all the elements together. 2007 Pinot Noir, Marin County (unfiltered bottling):We were able to compare this bottling side by side with the regular one. The color of the two was almost identical. The unfiltered bottling showed a touch of reduction at first, but it blew off with some air. Aromas and flavors were fairly similar, though the oak was slightly more apparent on the unfiltered bottling. The biggest difference was that the acidity and tannin of the unfiltered wine was more pronounced. 2008 Pinot Noir, Marin County (barrel sample): (Tasted at Marin Pinot Noir Celebration in 6/10). About 70% whole-cluster fermentation. Medium-light ruby color, with a distinct floral aroma plus black cherry / raspberry fruit and spice. Very lively on the palate, and not especially tannic given all the whole cluster fermentation. With a surprising lack of youthful stemmy character in the aromas, this could be a really interesting wine as it gets some bottle age. 2009 Pinot Noir, Marin County (barrel sample): Light color, with bright, ripe strawberry and cherry aromas along with some spicy oak undertones. Considering this was made with 50% whole cluster fermentation, I was surprised that it did not seem “stemmy” at all. Overall, this displayed great purity of fruit and it shows a lot of promise. 2005 Syrah, Shenandoah Valley: Medium-dark color, bright boysenberry and black raspberry aromas along with notes of iron and mineral. Fairly big in the mouth but with decent acidity and good balance, and fairly mild tannins. 2007 Syrah, Shenandoah Valley: Medium-dark color, with fruit that seemed a bit less ripe than the ’05, but otherwise with a similar profile. The biggest difference was a meaty, savory streak that I didn’t detect in the ’05 bottling. Medium-bodied on the palate with a long, clean finish. 2007 Syrah, Shenandoah Valley (unfiltered bottling): Medium-dark color, this was an interesting contrast with the regular release. The fruit aromas were brighter and prettier than the regular bottling, while a more earthy note replaced the meaty one. Similar mouthfeel and finish to the regular release. As we walked through the vineyard at the beginning of August of this particularly cool summer, we saw just the barest beginning of veraison with a few clusters of the 115 and 777 Pinot clones, though Stewart said that the progress of the fruit is not too far behind most years. The yield is generally around two tons per acre. I should note here that there is loads of detailed vineyard and winemaking information on the Kendric website – a great destination for wine geeks! At harvest, the vineyard is generally picked clone by clone since these ripen at different times. The fruit was entirely destemmed in 2004 (the first commercial vintage) and 2005, but more whole clusters have been used for fermentation in recent years – the 2008 was 70% whole cluster and the 2009 was 50%. Stewart foot-treads the whole cluster fruit to help the fermentation. My tasting notes on barrel samples of these two vintages indicate that the tell-tale “stemmy” aromas that often come with whole-cluster fermentation are surprisingly all but absent in these wines. Stewart inoculates for both primary fermentation (mostly Assmanhausen yeast) and malolactic, noting that it’s difficult to know what yeast and bacteria strains there may be in the custom-crush facilities where he’s made the wines. The Pinots are typically barrel-aged for about 16 months – longer than is the case with many Pinots these days – in an effort to bring out more of the wine’s spicy and earthy components rather than to highlight the upfront fruit aspect. Stewart uses around 40% new oak, with his favorite coopers being Cadus, and François Frères from the Bertrange forest. Due to the inherent uncertainties of making wine in a custom-crush facility, Stewart has usually had the wines filtered at bottling. Stewart is hoping to convert an old dairy barn on the property into a winemaking facility, and he told us that he would probably try some native fermentations and bottle unfiltered when he’s able to make wine at his own place. He does often bottle a small amount of wine unfiltered to test against the regular bottling, and we were able to taste some of those unfiltered wines. Besides going into the Kendric Pinots, fruit from the vineyard has also gone to other producers, including Pey-Marin, Miller Wine Works, and McEvoy Ranch, though currently it’s only sold to McEvoy. The Kendric Pinot production has been a few hundred cases per year, and the ’09 will be a bit more, about 650 cases. Stewart is expecting the production to go down this year as he’s hoping to sell more fruit again. It currently goes into a single “Marin County” bottling, but it’s possible that there may be single-clone bottlings from the 115 and 37 clones in the future. In addition to Pinot Noir, Kendric also makes a Syrah, sourced from the family’s Shendandoah Valley Reward Ranch vineyard. The Syrah was planted in 2001. Stewart told us about the large boulders he had to move to plant the Syrah – ironically, these were boulders that he had moved to that portion of the property from the areas he’d planted earlier with Sangiovese! The soil is mostly volcanic and granitic in origin, and the Syrah clone is 877. After the fruit is picked and destemmed, Stewart does some foot-treading to break up berries, and he gives the wine an extended maceration to give it more structure. Stewart gathered us beneath a large oak tree in the vineyard, where he set out some bread and cheese for us to munch on while we tasted through a vertical of nearly all of the Kendric Pinot Noirs to date, as well as a few of the Syrahs. Al and I had tasted a barrel sample of the ’08 Pinot in early June, and I’ve included my note on that wine here to complete the vertical. We also tasted a couple of unfiltered bottlings to compare alongside the regular releases. Stewart noted that his preference between filtered and unfiltered bottlings changes and of course the wines are developing all the time. 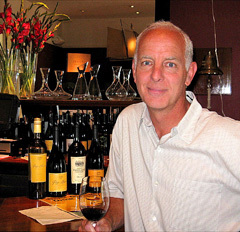 Stewart Johnson is making some of the best Pinot Noir from Marin County. The Kendric Pinots are generally lighter-bodied, with red fruits, restrained oak, some floral and tea leaf notes, and excellent acidity and structure for mid-term aging (and they should benefit from some bottle age). The ’04 and ’06 vintages were particularly elegant and delicious, and the barrel samples show good potential for upcoming releases. The Amador Syrahs showed good bright fruit, ripe but not jammy, and with distinctive iron/mineral notes that I sometimes find in wines from the Sierra Foothills. The Kendric wines fly below the radar but are well worth seeking out. We enjoyed our visit with Stewart, but it was time for us to move along, and we headed down the rural roads of West Marin to the tiny town of Nicasio. There we had a relaxing lunch on the patio of the Rancho Nicasio restaurant, enjoying local oysters, portobello mushroom sandwiches, and other delicious fare. After finishing our lunch, we walked outside and waited for a few minutes for our afternoon appointment, with Marin grower Mark Pasternak. If you want to learn about Marin County wine, Mark Pasternak is the person you most need to meet. He’s been growing winegrapes in Marin for 30 years, and he now either farms or consults on farming for most of the vineyard land in the county, over 100 acres in total. As with Stewart, I’d met Mark at the Marin County Pinot Noir Celebration, which he helps to organize every year. Mark grew up in the Los Angeles area, but he wanted to get out of the city and become a farmer. With his father’s help, Mark bought 65 acres of Devil’s Gulch Ranch in the Nicasio area of West Marin in 1971, when he was only 19, and he added 10 more acres in the ‘90s. The ranch itself dates to the 1860s, with a barn built in 1867 that’s still in use. Most of the original 873-acre ranch lands are now part of the Golden Gate National Recreational Area. At first Mark just raised pigs and chickens. In the late ‘70s, he decided to plant grapes – he joked that he was looking for something legal to grow there – and he took some viticulture classes. The rest, as they say, is history. The Pinot Noir that Mark grows at Devil’s Gulch goes to a couple of acclaimed winemakers, Dan Goldfield and Sean Thackrey, and he’s become the man to see if you’re thinking of planting a vineyard in the region. Mark’s wife Myriam Kaplan-Pasternak is a veterinarian, and she has been actively involved with helping to develop sustainable agriculture around the world since her days in the Peace Corps during the ‘80s. She has been especially involved in relief efforts in Haiti since the devastating earthquake there – information on her work there can be found on the Devil’s Gulch website. 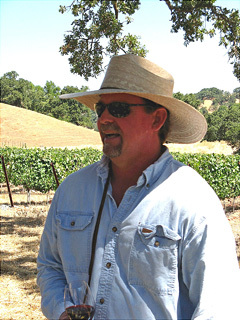 In addition to his vineyard, Mark raises pigs, rabbits, sheep, and quail at Devil’s Gulch Ranch, and the meats are very highly-regarded, going to many of the top restaurants in the Bay Area. He breeds Quarter Horses at the ranch as well. He’s an instantly recognizable figure in his trademark cowboy hat and “Devil’s Gulch” t-shirt, and like many winegrape growers, he’s quite a character as well. 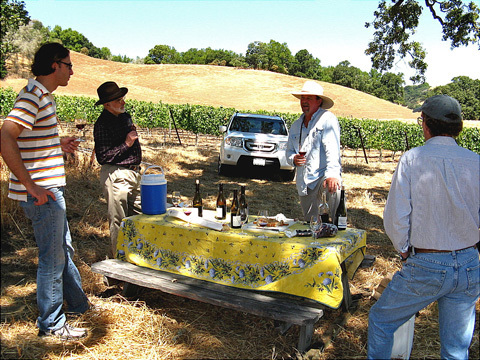 Mark rolled up in his pickup truck across the road from Rancho Nicasio, and after greeting all of us, we asked him about a vineyard we could see high above us on a hilltop just north of town. That’s Redding Ranch, Mark told us – want to go up there? Of course! We needed to make sure at least one of us had a vehicle that could make it up the steep and rutted dirt road, so we all hopped into my Subaru Forester and followed Mark’s pickup truck up the hill. Acacia Vineyard 2008 Pinot Noir, Redding Ranch: (Tasted at Marin Pinot Noir Celebration in 6/10). Medium-light color, ripe red fruits with earth and mineral notes along with some vanilla/oak undertones, medium-bodied with good acidity and structure. Orogeny Vineyards 2006 Pinot Noir, Redding Ranch: (Tasted at Marin Pinot Noir Celebration in 6/09). Medium color, showing tart red fruits with some earth and tea leaf notes. Fairly light-bodied, with fresh acidity and a clean, mid-length finish. 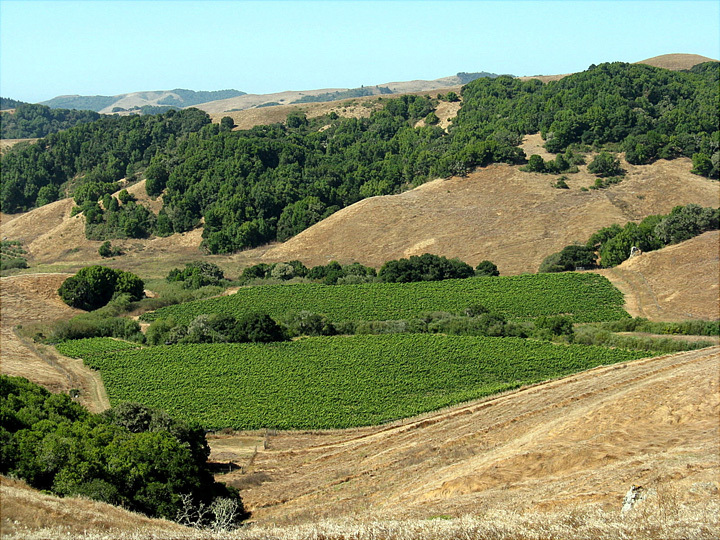 At an elevation of 1,100-feet, the vineyard has a commanding view over Nicasio and the surrounding area. Mark planted the 20-acre vineyard in 2000. Redding Ranch itself is a larger property, part of which is adjacent to film-maker George Lucas’ Skywalker Ranch. The vineyard’s background and very name have a somewhat confusing history. The vineyard had been leased to the Chalone Wine Group and set up for their Orogeny label, with the wine made by Dan Goldfield. Through various ownership changes, control of the vineyard passed through several hands including Chalone and Diageo, and is now back to the original owner. The vineyard had been called the McNeil Vineyard before becoming known as Redding Ranch. But even though that’s the official vineyard name, we heard several people in Marin refer to it as the “Chalone” vineyard because of their association with it. The vineyard is planted entirely to Pinot Noir, with 115, 667, 777, 828, and Pommard clones on the steep, mostly west-facing hillside. Mark pointed out the reddish, iron-rich sandstone soil, and noted that it was unusual in Marin vineyards – indeed, I did not see any other soil like it on my visits elsewhere in the area. High on the hill, the vineyard is quite exposed to the wind coming from the coast, and Mark said that can cause difficulties with the vines. He noted that the grape clusters had lots of shatter this year, and it will be small crop, perhaps only about 1 ton per acre. Orogeny Winery had gotten fruit from Redding Ranch in the past, and currently Acacia is making a Pinot Noir from this fruit, their first Marin County Pinot. I’ve included tasting notes of a couple of Pinots from Redding Ranch fruit, from the past two Marin County Pinot Noir Celebration events. Fortunately my car’s brakes were in good shape as we made it safely back down the hill into Nicasio, and we continued to follow Mark north from there until we reached Azaya Ranch Vineyard, located along Hicks Valley Road. Directly across the road is Lincoln School, one of three one-room schoolhouses still operating in West Marin (there are only about a dozen in the entire state). Mark pointed out the proximity of some of the other local vineyards, noting that the Corda Family Vineyard is just over the hills to the northeast, while the Stubbs Vineyard is a short way to the northwest. Azaya is the youngest of the vineyards we visited, with Mark having planted it in 2006. There are currently 18 acres of vines, with an additional 12-15 acres prepared for possible future plantings. Sited on a low southwest-facing slope, Mark told us that the location is windier than expected, and indeed the grape clusters there looked fairly sparse, similar to those at Redding Ranch. And also like Redding Ranch, we did not see any sign of veraison starting at the vineyard. We noted that the soil was more tannish-brown than the red soil we saw at Redidng Ranch. Mark said that the soil at Azaya is a deeper clay loam soil, with sandstone below. The vines are laid out with 4x8-foot spacing, and the vineyard is farmed organically but is not certified organic. Like Redding Ranch, Azaya is also 100% Pinot Noir, with 115, 667, 777, 828, Swan, and 2A clones currently planted. Mark is planning to add Pommard in the future. Fruit at Azaya goes to Dutton-Goldfield, DeLoach, and Schramsberg. Mark told us that Hartford Court and Woodenhead will be getting some fruit from here starting this year. As there have not been any single-vineyard Azaya Ranch wines at this point, I don’t have any accompanying tasting notes. Our final vineyard visit of the day was to Devil’s Gulch Ranch, Mark Pasternak’s own vineyard. We drove back into Nicasio, then headed along a narrow road a short distance southwest out of town. As noted earlier, the ranch is far from a grapes-only operation, and in fact, Mark even grows asparagus in some of the vine rows – he joked that the asparagus might be worth more than the grapes! Mark makes good use of the animals he raises to produce compost for the vineyard. There is a prominent windmill on top of the hill in the midst of the vineyard. An earlier small windmill had provided power in the early days when the ranch was “off the grid,” but Mark connected to the local utility when the vineyard was planted and more power was needed to pump water for irrigation. The current windmill was installed in 2005 and is capable of producing around 35kW of power but it was not working when we visited. Mark related a long and amusing story of the current problems with getting the windmill working again – including dealing with a family of owls that were living inside of it! Dutton-Goldfield Winery 2006 Pinot Noir, Devil’s Gulch Ranch: (Tasted at Marin Pinot Noir Celebration in 6/09). From Dijon clones. Medium color, with floral red fruit aromas. More full-bodied than most wines at this tasting but with good balancing acidity, this had some mild tannins on the medium-length finish. Dutton-Goldfield Winery 2007 Pinot Noir, Devil’s Gulch Ranch: (Tasted at Marin Pinot Noir Celebration in 6/09). Medium color, more subdued nose of black cherry/raspberry along with some oaky notes, and a bit lighter on the palate than the ’06. Dutton-Goldfield Winery 2008 Pinot Noir, Devil’s Gulch Ranch: (Tasted at Marin Pinot Noir Celebration in 6/10). Aged 14 months in 33% new oak. Medium-light color, intensely aromatic, with ripe cherry, flowers, and spicy oak. In the mouth, this seemed more extracted than most wines at the tasting, but still balanced, nice. Sean Thackrey 2006 “Andromeda” Pinot Noir, Devil’s Gulch Ranch: (Tasted at Marin Pinot Noir Celebration in 6/10). From old-vine Martini clone plus newer 115, 667, and 777, 50% new oak. Medium red-purple color, displaying bright and spicy red fruits, with hints of earth and dried herbs – maybe a touch of mint. Great acidity on the palate, where a bit of tartness creeps in, and a very long, tasty finish. Sean Thackrey 2007 “Andromeda” Pinot Noir, Devil’s Gulch Ranch: (Tasted at Marin Pinot Noir Celebration in 6/10). A bit darker color than the ’06, with a more tangy cherry character and distinct clove notes. Bigger-bodied than the ’06, with more tannin on the finish. At an average elevation of about 700 feet, the vineyard is sited on a jumble of hillsides with several different exposures. The soil is somewhat rocky, although Mark told us that the soil is generally deeper than that at Redding Ranch. Sandstone underlies the surface clay, with some sandstone rocks visible in various parts of the vineyard. Older plantings had east-west row orientation, while newer ones are north-south, except for terraced blocks that cascade down the central hillside. Four acres are terraced – Mark noted that this area is on rockier soil and generally is the first to ripen. 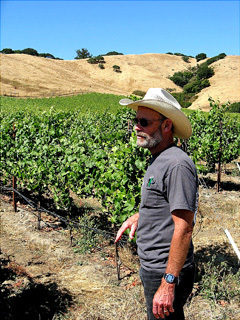 Mark originally planted the vineyard in 1980, the first commercial planting of winegrapes in West Marin. He was guided by noted viticultural professor Rich Thomas of Santa Rosa Junior College, who has taught many well-known winemakers over the years, as well as by Michael Michaud, who was then at Chalone Vineyard. The original plantings were seven acres – four acres of Chardonnay (Wente clone 4) and three acres of Pinot Noir (Martini clone 15). In 1998, 11 additional acres of Pinot Noir were planted, with 114, 115, 667, 777, all mixed in blocks row by row. These areas are picked by block, so there are a mixture of clones in each pick. There’s also a tiny block of Gewürztraminer. Early on, the fruit went to Marin producer Kalin Cellars for sparkling wine. In 1990, Mark had a little extra Pinot Noir to sell, but he had trouble finding a buyer until winemaker Dan Goldfield took a chance on it. He’s bought Pinot from Devil’s Gulch ever since, originally for La Crema and later for Hartford Court (which produced a Marin County Pinot bottling for several years), and more recently for his own Dutton-Goldfield label, which produces a Devil’s Gulch vineyard-designate bottling. The Pinot Noir fruit is currently split about 50/50 between Dutton-Goldfield and Sean Thackrey, for his “Andromeda” Pinot Noir. The Chardonnay has proven to be better-suited for sparkling wine and it now goes entirely to Schramsberg. I’ve included tasting notes of recent Dutton-Goldfield and Sean Thackrey Devil’s Gulch Pinots, from the past two Marin County Pinot Noir Celebration events. After our visit with Mark at Devil’s Gulch Ranch, Eric, Al, Paul, Atilla, and I all went our separate ways. But there were still more people and vineyards in Marin that I wanted to see after that first day’s visits, and I was able to arrange a couple of appointments on a late-August Friday. The first stop was at Stubbs Vineyard, not too far from Azaya Vineyard where I’d been a few weeks before. I managed to find the address along Marshall-Petaluma Road and proceeded up the long, tree-lined drive to meet vineyard owner Mary Stubbs at her house. As with Stewart and Mark, I’d first met Mary at the Marin County Pinot Noir Celebration. Mary and her husband Tom, who works in real estate in San Francisco, purchased their property in Marin in 1982. Originally 1,200 acres, they later sold half of the land. They moved to the property full-time in 1992 and built a beautiful house there, where they live with their three children. Always environmentally-conscious, they were the second property owners in Marin to sell an agricultural easement to MALT. Over the years, they’ve been big supporters of MALT as well as of Marin Organic. Marin Organic is an association of organic farmers, ranchers, and food producers in the county. I spotted prominently-displayed Marin Organic member signs at quite a few West Marin cafés and restaurants on my travels. Mary and Tom have farmed their vineyard organically ever since it was planted in 1996, and currently it is the only certified organic vineyard in Marin County. Their property is “off the grid” – they are not connected to the local utility company power, and almost everything they need is powered by their own wind- and solar-powered electricity, though they do have a diesel generator for pumping irrigation water. Their farming equipment is electric and biodiesel. Mary took me for a ride on their rechargeable electric ATV down a dirt road to their “tasting room” – a picturesque spot overlooking the vineyard – where we talked about the vineyard and the Stubbs wines. 2006 Pinot Noir, Estate Grown, Marin County: (Tasted at Marin Pinot Noir Celebration in 6/10). Medium-light reddish-purple, some floral notes along with bright cherry, earth, and a touch of leather. Medium-bodied with very good acidity, there was some tartness and tannin on the finish. 2007 Pinot Noir, Estate Grown, Marin County: (Tasted at Marin Pinot Noir Celebration in 6/10). Medium-light purple color, the aromatics were more closed than on the ’06 wine, but displayed a bit riper fruit and some spice. Slightly more weight on the palate, and a rounder and smoother finish than the ’06. Mary spends lot of her time selling wine, with most of it going to many top Bay Area restaurants, as well as to a handful of restaurants elsewhere in the country and to mailing list customers. Mary’s background is in magazine and newspaper work, and she and Tom had long had a serious interest in food and wine. After they moved to their Marin property in the early ‘90s, they wanted to put their land to good use and felt grapes were most viable crop there. Like Mark Pasternak, they learned from Rich Thomas at Santa Rosa Junior College, and he helped with the vineyard layout. The 11-acre vineyard is in a bowl surrounded by high hills. It’s a very cool location that can be prone to frost. There are sprinklers for frost protection but the limited water supply sometimes leads to difficult choices between frost protection and having enough irrigation water to get the vines through the long growing season – repeated spring frosts in 2008 reduced their Pinot Noir production to only 140 cases. The particularly cool location means that the Stubbs have to do some leaf pulling to expose the fruit to more sunlight – unfortunately the heat spike that hit northern California a few days before my visit caused a bit of sunburned fruit, as it did at many other vineyards. Mary noted that the fruit had barely begun veraison this year, due to the cool summer, and she’s hoping for warmer weather over the next couple of months. There are 6.7 acres of Chardonnay clone 76 planted, and 4.3 acres of Pinot Noir clone 114, all on 3309 rootstock. The soil is mostly clay loam. Mary noted that despite the differing acreages planted, they usually end up with just about an equal amount of fruit from their Chardonnay and Pinot vines each year. Mary and Tom have just one full-time vineyard employee, who’s been with them from the start. They bring in larger crews when needed for more labor-intensive operations. All the vines are on VSP trellising, with various wildflowers for cover crop in the 8-foot spacing between vine rows. Mary told me that although there are no current plans to expand their vineyard, it’s possible that this could be done in the future. Mary and Tom did not originally plan to make their own wine, and for a number of years they sold fruit to Kendall-Jackson, Schramsberg, Pey-Marin, Hartford Court, and others. Eventually, they realized that it made more sense economically to make their own wine. After meeting Dan Goldfield, they brought him on board as winemaker, and the first vintage of Stubbs wine was in 2002. They now use the fruit from their entire vineyard for their own production. They made a Merlot from Corda Vineyard in 2005, to help out due to a small Pinot crop that year, and they continued with a Merlot in 2006, but other than those two bottlings, all of their wines have been estate-grown. Dan Goldfield continues to make the wine, producing it at the Dutton-Goldfield facility in Sonoma County. Annual production is generally around 1,800 cases, with their highest production to date being about 2,500 cases. Mary feels that Dan is one of the finest Pinot winemakers around, and she’s very pleased that he’s making their wine. She describes his winemaking for Stubbs as being on the “Burgundian” side (though I know that can be a loaded term), making wines in a fairly restrained and elegant style – that seems a good match with the typically delicate nature of Marin fruit. I’ve included tasting notes of two vintages of Stubbs Pinot Noir that I tasted at this year’s Marin County Pinot Noir Celebration. I wish I’d been able to taste more of the Stubbs wines. From the few I’ve tried, they’re undeniably well-made (as you’d expect from Dan Goldfield), but I can’t say that I’ve tasted enough of the wines to detect a common thread running through them. I do get the sense that the Stubbs Vineyard, located as it is in one of the more challenging cool-climate sites I visited in Marin, is likely to reflect vintage variations more than with some other vineyards, and I imagine the wines will reflect this as well. After saying goodbye to Mary, I drove west along Marshall-Petaluma Road for miles through the pastoral landscape. I finally emerged from the rolling hills at the village of Marshall along Tomales Bay. Home to the famed Hog Island Oyster Company, there’s not much to Marshall itself, but there’s a beautiful view from Highway 1 on the eastern edge of the bay across the water to Point Reyes peninsula. The San Andreas Fault runs through the long narrow bay – the Point Reyes peninsula has moved hundreds of miles from the south to its present location, and it will continue on to the north as the fault continues to slip. As I drove south toward the town of Point Reyes Station, I passed by Point Reyes Vineyard, located just off Tomales Bay. The tasting room was closed, so I continued into town for a tasty lunch at the Station House Café. Point Reyes Station is the only town of any size in the area, and it’s often thought of as the unofficial “capital” of West Marin. After lunch, I headed south a few more miles to Olema (near the epicenter of the 1906 earthquake) and stopped there at the quaint Olema Inn for my next appointment of the day. I waited for a few minutes inside the small wine bar of the Olema Inn before Jonathan Pey appeared. He told me that the Olema Inn has been pouring and selling his wines since May 2009, and that he’s very pleased with how it’s been working out. Other than this arrangement, the Point Reyes Vineyard tasting room a few miles up the road is currently the only winery tasting room in Marin County, so it’s a good opportunity for the wines to be exposed to a wider audience. Both Jonathan and his wife Susan have long backgrounds in the wine business. Jonathan has worked at distinguished wineries around the world, including Domaine Louis Jadot in Burgundy, Penfolds in Australia, and Robert Mondavi in California, just to name a few. Susan has worked in the service side of the wine business, and is now one of the leading wine buyers for restaurants throughout North America. Together, they handle virtually all aspects of their own wine business, while raising three young daughters at the same time. Jonathan and Susan became interested in producing their own wines from Marin County when Jonathan was the General Manager for Schramsberg Vineyards. As we’ve seen, Schramsberg has been – and remains – the largest single buyer of winegrapes from Marin, so he was already familiar with the territory and he felt that the soils and climate of the area were just what he and Susan were looking for to make their own wines. As related on the Scenic Root website, Jonathan also credits a book called “Early Marin” by Jack Mason as spurring his interest in the area, as the book mentioned Marin vineyards that predated any in Napa. Further research uncovered more of the long-forgotten background of Marin vineyards and wineries. Jonathan & Susan’s first wines appeared from the 1999 vintage, and the Peys’ production has slowly expanded from there, although it remains small, at only around 300-500 cases of each wine per year. Most of the various Scenic Root wines are made at the Bin to Bottle facility between American Canyon and Napa, while their lone white wine, a Riesling, is made at Bouchaine in Carneros. All of the wines are sourced from fruit that is farmed sustainably, and the Peys choose vineyards that farm their fruit organically when possible. I joined Jonathan at the tasting bar, as late lunch diners finished their meals in the adjacent dining room of the Olema Inn restaurant (which Jonathan highly recommends, by the way). The Inn’s staff handles the wine tastings, and they poured both of us a flight of the current wines – Pey-Marin Riesling and Pinot Noir, Mount Tamalpais Merlot, and Spicerack Syrah. As we tasted through the wines, Jonathan told me about each of them. One of the many top-notch wineries where Jonathan worked was at Trimbach in Alsace, so he’d long had an interest in Riesling. As there was no Riesling planted in Marin County, he looked for recommendations on how to go about growing some there. Among the people he spoke with was Randall Grahm, who suggested using a less-common clone of the grape, the Neustadt clone. In 2003, Jonathan grafted over some older vines to this Riesling clone at the Corda Vineyard, a portion of which he was then leasing and farming himself. Known for more “steely” and less “dieselly” wines, the Neustadt clone has produced wines that the Peys have been very pleased with. Jonathan noted that the vines at Corda will only yield about two tons per acre, whereas most Riesling vines are capable of producing very good fruit at 4-5 tons per acre. The Riesling fruit is picked at night, and put through a Champagne press. Jonathan told me that it’s usually picked at around 21-22.5 brix, with a pH is around 3.2. It goes through a cool fermentation for up to one month in stainless steel. It’s racked off the gross lees, and there is some batonnage on fine lees. The wine does not go through malolactic fermentation, and spends no time in oak. Finished alcohol is usually in the 12-13% range, and the wines are very dry, only about 0.2g/L residual sugar, which is about as little as you’ll see in any wine. Jonathan says he’s found that the older vintages are aging quite well. He feels the current 2009 vintage is their best yet – he realizes that he sounds like a typical winemaker saying that, but he truly believes it. The Marin County Pinot Noir – called “Trois Filles” for the Peys’ three daughters – is blended from multiple vineyards and multiple clones by design. Jonathan feels that too many wines are produced from single vineyards, when combining fruit from multiple sources can often produce a better wine. Vineyard sources vary from year to year, and they have included Corda, Redding Ranch, Stubbs, and Kendric vineyards in the past. Jonathan prefers to source fruit from vines that are at least ten years old, and also seeks out fruit that is organically farmed. He noted that the yields from the fruit he sources are quite low, often only 1 to 1½ tons per acre. Yields this low are not intentional, and he told me that continual low fruit yields are an issue in Marin County – a sign of how marginal many of the vineyards are in such a cool climate. He also told me that fruit clusters from Marin vineyards tend to be tiny – the Pinot clusters he sees from Marin vs. those from the Santa Lucia Highlands are often dramatically different in size. 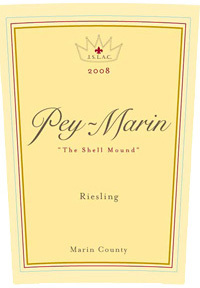 Pey-Marin Vineyards 2009 Riesling, “The Shell Mound,” Marin County: Very light straw color, lemon/citrus and a touch of white peach, very minerally/stony, with an intriguing slightly briny note. Bracing acidity in the mouth continued to tingle the tongue even after the long finish. Should be an ideal match for oysters and other shellfish, and also white cheeses. Jonathan says it can also work as an alternate to beer with barbeque. Pey-Marin Vineyards 2007 Pinot Noir, “Trois Filles,” Marin County: Medium ruby color, black cherry aroma with light floral accents and some clove/spice overtones. Great balance – the acidity kept the mouthfeel very lively, yet it was balanced by the roundness supplied by the barrel-aging. Smooth and flavorful finish, one of the best Marin Pinot Noirs out there. Mount Tamalpais Vineyards 2006 Merlot, Marin County: Medium-dark color, slightly herbal plum and spice aromas along with a backbone of minerality. A leaner style of Merlot with moderate richness on the palate, good acidity and structure, and a clean finish. It’s a shame that this will be the last Merlot from here, as it’s a fine example of this style. Spicerack 2007 Syrah, “Punchdown,” Sonoma Coast: Dark color, featuring dark fruits, a touch of spice, and a blast of white pepper on the nose, all framing a very minerally core. Medium-full weight on the palate, with bright acidity and refined tannins. This really reflects its cool-climate vineyard origins well. The Marin Pinot fruit is usually picked around 24 to 25.5 brix but is sometimes lower, resulting in a finished alcohol for the wine that’s typically in the 13-14% range. A series of careful hand-sorts of the fruit takes place both at the vineyard and at the winery. Jonathan has avoided using any stems in the Pinot, though there are some whole berries. After a couple of days of cold soak in a stainless steel tank, he will allow native fermentation to start on its own (though he questions whether “native” yeasts are from the vineyard or the winery), but will then inoculate with a selected yeast strain partway through fermentation. Press wine is not used for the final blend. Jonathan will usually let the wine go through malolactic fermentation on its own. Barrels are generally about 30-40% new French oak, and the wine remains in barrel for around 14 months prior to bottling, then spends another six months in bottle before being released. Jonathan told me that his goal for the Pinot Noir is to express the variety, the place, and the barrels. He also said that the Marin County Pinot has been the toughest of his wines to make, largely due to the different fruit sources each year, which always raise different issues. 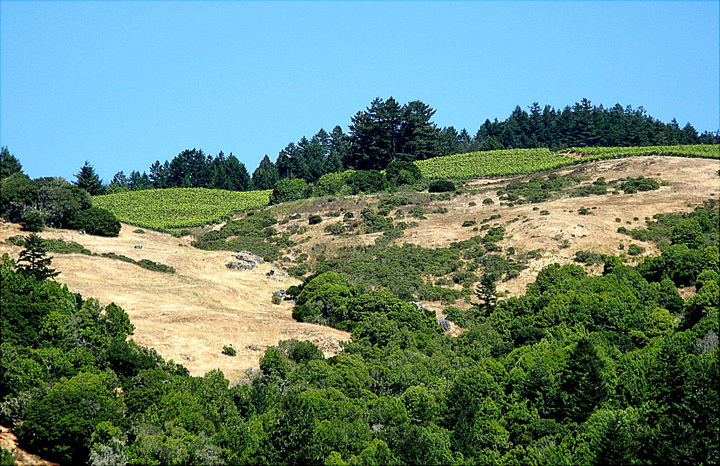 The Mount Tamalpais Merlot was sourced from Corda Vineyard. The vines were planted in 1990, but 2006 was the last vintage for Corda Merlot, as it was grafted over to Pinot Noir after that. Jonathan and Susan started out making Merlot in their very first vintage in 1999. The difficulty of ripening Merlot in the cool climate of West Marin finally led to its demise in the vineyard – while Jonathan noted that the fruit could produce some very good wines, it only ripened adequately in about 30% of the vintages. He worked with Ben Henry, a viticultural consultant experienced in cool-climate growing conditions, when he was working with the Merlot from Corda. Jonathan told me that the vines could produce as much as five tons per acre but the fruit would not ripen well at that crop load, and dropping too much fruit during the growing season to get the remaining fruit ripe was just not economically viable in the long term. About 30% new oak was used on the Merlot, which Jonathan told me is now down to the last few cases of that final 2006 vintage. The last wine we tasted was the Spicerack Sonoma Coast Syrah. The fruit is sourced from Rodgers Creek Vineyard on the slopes of Sonoma Mountain – Ramey and Skylark also make Syrah from this vineyard. The concept for this wine came from Jonathan’s experience at Penfolds. Their St. Henri Shiraz is a cooler-climate bottling that uses no new oak. The Spicerack is also from a very cool-climate location, one of the few Syrahs from the Sonoma Coast appellation, and Jonathan uses no new oak for aging this wine, with most barrels being old enough to be considered “neutral” oak. The fruit is entirely destemmed prior to fermentation, and a touch of Grenache is usually blended in. As we finished up the tasting, we talked briefly about some of the other Scenic Root wines. The Pey-Lucia Pinot Noir is sourced from Lone Oak Vineyard, just north of Rosella’s Vineyard in Santa Lucia Highlands. There are two Cabernet Sauvignons made under the Textbook label – a Napa Valley and an Oakville bottling. Jonathan told me that the Textbook name came about because an early taster of the wine told him that it was “textbook” Oakville Cabernet. The Pey-Marin wines and related Scenic Root labels display a deft winemaking touch, and have continually been among the finest wines produced from Marin County fruit. Jonathan Pey has aimed for specific goals in each of his wines and from what I’ve tasted, he’s achieved those goals quite well. There’s a common current of minerality and bright acidity that lifts these wines beautifully – they’re the kind of wines you want to have another glass of, and that’s always a good sign. The Corda family has been farming in Marin since the 1880’s, and they own numerous ranch properties in the county, including the one that Stewart Johnson leases for his Kendric Vineyard. The Cordas’ own vineyard is located on the 800-acre Corda Ranch, off of Chileno Valley Road southwest of Petaluma. I was able to visit the vineyard with Stephan Schindler, who is launching his new Easkoot wine label with a 2009 Pinot Noir from the vineyard, and his new winemaker, Matt Duffy of Vinify Wine Services in Santa Rosa. By good fortune, I met Stephan just a week earlier when I was asked to help bottle his wine by his previous winemaker, Shane McManigle, who recently took a position as assistant winemaker at Belle Pente Winery in Willamette Valley. Stephan, Matt, and I met up a short ways off Chileno Valley Road, where we jumped into Matt’s truck and continued a couple of miles south along a bumpy dirt road until we reached the vineyard. 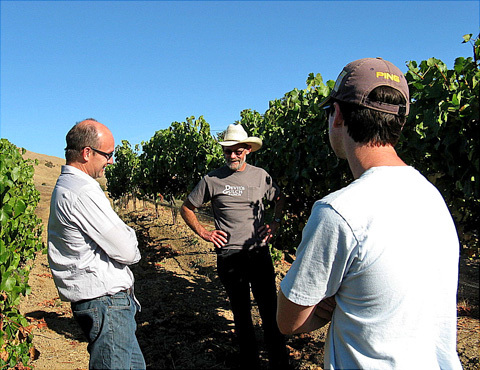 There we met – who else – Mark Pasternak, who leases and farms this vineyard. There is some confusion evident with the vineyard name – some wineries list it on their label as “Chileno Valley Vineyard” while others show it as “Corda Family Vineyard”. No one I talked with had an answer as to why both names are used or whether one is preferred over the other. But as most people I met referred to it as “Corda,” that’s what I’ll call it here. This vineyard visit was mainly for Stephan and Matt to assess the progress of the fruit that they would be getting this fall, but I was able to get in a few questions to Mark about the background of the vineyard as well. And incidentally, the vineyard looked very good – even though the vines are being dry-farmed for the first time this year, they looked healthy and not water-stressed. The Pinot clusters were well along toward finishing veraison, and the crop level looked pretty good, certainly more fruit on the vines than I’d seen earlier in the month at Redding Ranch or Azaya. Mark thought there was going to be a decent crop at Corda this year, with a good but not ideal fruit set there. He showed Stephan and Matt what fruit he was planning to drop soon – those clusters that were still mostly green, and trimming wings off of other clusters. We noted the small size of clusters, and just as Jonathan Pey had mentioned earlier, Mark told us that was typical of Marin fruit. Corda Winery 2006 Pinot Noir, Marin County: Medium-light color, with a pretty nose of bright red fruits and a touch of spice, a fairly nice texture and mid-palate, and a smoother finish. Precedent Wines 2006 Pinot Noir, Chileno Valley Vineyard: (Tasted at Marin Pinot Noir Celebration in 6/09). 30% whole-cluster fermentation, all native yeast, 40% new oak. Fairly light in color, with very pretty floral and bright red fruit aromas, along with some whole-cluster spice and herbal notes. Very lively acidity on the palate and long, clean finish. Thomas Fogarty Winery 2007 Pinot Noir, Corda Family Vineyard: (Tasted at Marin Pinot Noir Celebration in 6/10). About 25% whole-cluster fermentation, 40% new oak. Medium-light color, strawberry / cranberry along with some stemmy and spicy aromas, some wet stone / mineral notes, and vanilla/oak undertones. Firm and structured on the palate, with a lively finish, quite nice. Vergari Wines 2007 Pinot Noir, Marin County: (Tasted at Marin Pinot Noir Celebration in 6/10). Sourced from Corda Vineyard. Medium-light color, with black cherry fruit, clove/spice, and a touch of funk that mostly blew off but gave the wine some interesting complexity. Nicely structured in the mouth with milder tannins than the ’06. A distinctive and nuanced wine. Vergari Wines 2008 Pinot Noir, Marin County: (Tasted at Marin Pinot Noir Celebration in 6/10). Sourced from Corda Vineyard. Medium-light red-purple color and slightly cloudy, pretty floral notes and cherry / raspberry fruit, along with a nicely-integrated touch of oak. Medium-bodied on the palate, this could use a bit more time to settle down but shows some good potential. Vision Cellars 2007 Pinot Noir, Chileno Valley Vineyard: (Tasted at Marin Pinot Noir Celebration in 6/10). Medium-light color, bright cherry / raspberry with some earthy overtones. Fairly light-bodied, with a lively mouthfeel and medium finish. Vision Cellars 1998 Pinot Noir, Chileno Valley Vineyard: (Tasted at Marin Pinot Noir Celebration in 6/10). Slightly lighter red-purple, showing a little brick color around the edges. Displaying very spicy red fruits, this still seems fairly youthful, with plenty of acidity and brightness on the palate. Aging very nicely, and should have a number of good years ahead. Willowbrook Cellars 2008 Pinot Noir, Chileno Valley Vineyard: (Tasted at Marin Pinot Noir Celebration in 6/10). About 70% new oak, with around half of that being Polish oak. A little lighter in color, this had brighter fruit aromas of cranberry and strawberry, along with a pretty floral component and spicy oak undertones. Medium weight in the mouth plus some tongue-tingling acidity and a little tannic bite on the finish. There are two main sections of the Corda vineyard, upper and lower, with both planted in 1990-1. It’s sited on a northeast-facing hillside, with vine rows running roughly east-west. The vineyard was originally about 50 acres in size, and though it now has only about 35 acres planted, it’s still the largest in Marin County. It was planted by Eric Neil, who had worked with Joseph Phelps Vineyards, and Mark started farming it around 2002-3. Mark noted that the vineyard was planted in area of the ranch with lower magnesium content in the soil – as mentioned earlier, much of Marin has soil that is high in magnesium, which is not good for the vines. He told us that the soil at the vineyard is mostly clay loam with sandstone below, fairly typical of what I saw at other Marin vineyards. Surprisingly, the Corda vineyard was originally planted mostly to Bordeaux varieties, with only three acres of Pinot planted. Over 40 acres were planted to Bordeaux varieties – about 35 acres of Merlot with some Cabernet Sauvignon and Cabernet Franc – plus some Chardonnay in addition to the Pinot. The Corda Winery produced a “Meritage” wine from the Bordeaux varieties. The original Pinot vines came from a “suitcase” clone of indeterminate origin. Most of the other vines have been grafted over to Pinot Noir over the years. A little Merlot remained through 2006 vintage (as we’ve seen, some of that had gone to both Stubbs and Pey-Marin) but was grafted over to Pinot after that. Two acres of the original Merlot vines were grafted to Riesling by Jonathan Pey in 2003. Besides the original planting, more recent Pinot plantings include 115, 667, 777, 828, Swan, and Pommard clones. Mark would like to bring in some 943, 2A, 23, and maybe some Martini clone in the future. Mac McDonald of Vision Cellars was the first to really make a mark with Pinot Noir from this vineyard. He first got fruit from there in 1997 and he’s made a Chileno Valley Vineyard Pinot ever since. A number of other producers have sourced fruit from there over the years, including Pey-Marin, Thomas Fogerty, Willowbrook, DeLoach, Vergari, Grant Family Wines, Russian River Vineyards, Schramsberg, Precedent, and now Easkoot, as well the Cordas’ own label. Schramsberg in particular continues to buy quite a bit from Corda for their sparkling wines. I’ve included tasting notes of some Pinots from Corda / Chileno Valley fruit, from the past two Marin County Pinot Noir Celebration events, including a rare taste of a twelve-year old bottling from Vision Cellars. Grape-growing and winemaking in Marin will probably never be big business. As we’ve seen, the difficulties of the landscape and climate can lead to fairly marginal crop yields, creating uncertain long-term economic viability for at least some of the area’s vines. All this almost assures that operations will remain on a small scale, so it’s tough to say if or when the wine industry will ever achieve the critical mass needed to push it to the next level. And in any case, it’s questionable whether growers and winemakers in Marin really want it to go to that level – I got the sense that most (though not all) are fairly happy with things as they are. But I also got the sense that having more resources available locally – which is not likely to happen without an increase in the number of vineyards and wineries – would not be a bad thing. So it’s a delicate balance between becoming bigger or staying small, not unlike the delicate balance that many wines from Marin display so well. With renewed interest in wines from cooler climates, with lower alcohol and higher natural acidity – just what Marin has to offer – the opportunity exists for at least some growth, and perhaps wider recognition. Even with highly-regarded producers such as Dutton-Goldfield and Sean Thackrey making Marin County wines, they remain little-known. The launch of a potentially high-profile label this year in Skywalker Ranch holds the potential that much-deserved recognition of Marin wines may yet be ahead. But as long as the quantities of these fine wines that get out to the wider marketplace remain tiny, that’s far from a sure thing. Despite the difficulties they face, Marin’s growers and winemakers a resolute group. There was something special about the promise of Marin County wines that drew them there, and I found them all determined to fulfill that promise. As always, thanks to everyone that we visited for being so generous with their time and their wine!